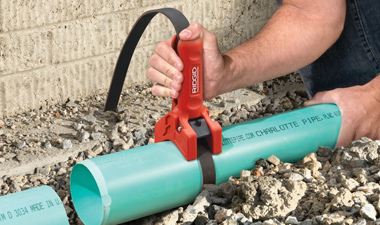 The first of its kind in the plumbing industry, the RIDGID® STRAPLOCK Pipe Handle simplifies the installation and maintenance of large diameter plastic pipe by helping users securely grip the pipe and apply force in all directions. The Pipe Handle grips plastic pipe 3 to 8 inches in diameter, features rapid size adjustment to quickly move between pipe sizes and has a specialized strap that provides maximum grip while minimizing marring. Its fixed handle position helps align and hold joints in place while glue sets. It is ideal for wet and cold environments where getting a grip on pipe can be difficult, gives maximum leverage in tight quarters and has an innovative locking design for quick applications. The handle can also be used in pairs to aid in complex installations. “There really wasn’t a good tool for turning and moving large diameter plastic pipe, especially in tight quarters. On some applications you can’t afford to lose your grip. The STRAPLOCK Pipe Handle gives you a rock solid grip giving you the leverage you need to make sure the job is done right,” said Josh Sooy, RIDGID marketing director. 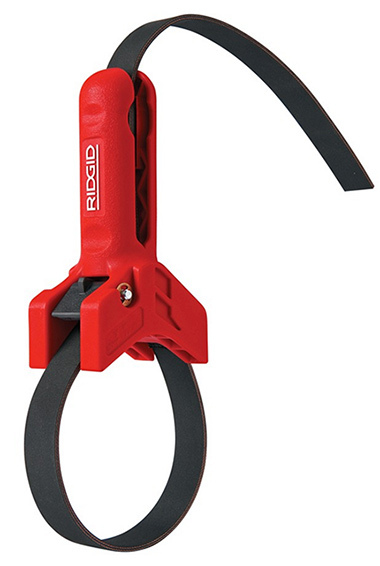 The Pipe Handle is the latest product in the RIDGID line of general purpose and hand tools. Each offers the same level of ruggedness and reliability professionals have come to expect from the RIDGID brand.